Shimla Local Kufri fagu Chail.. Enjoy Breathtaking Views of Shimla Hill Station Mall Road, Kalibari Temple, Jakhoo Temple, Church. Visit to Kufri Hill Station & Chail, Enjoy Skiing, Himalayan national Park, Mahasu Peak. All Sightseeing and Major Attractions of Manali like ,Hadimba temple, Manu temple, Vashisht Bath, Van Vihar, Tibetan Monastery, Club House, Rohtang pass. Start We start this package from Mumbai & book your flight tickets from Mumbai to Delhi. Our Holiday Travel Executive will meet you upon arrival at airport/railway station in Chandigarh. As 1st Option - We offer detour through Nalagarh - We drive to Nalagarh by Private AC Cab. En-route stopping overs at various scenic points for photo shoot. After Pinjor Garden, Proceed to Nalagarh which is approx 40 kms away. Upon arrival at Nalagarh , check in at Heritage Nalagarh Resort Hotel. Rest of the day is at your leisure. Enjoy your stay in the Nalagarh Resort- Maharaja Style..
You can also opt for Chandigarh Stay & still cover Nalagarh, which is 45 km from Chandigarh and is a gateway to Himachal Pradesh, we will have Retreat in Luxurious Heritage Nalagarh Resort Fort Resort nestled in the quaint Hills, built in 1421 during the reign of Raja Bikram Chand.at Nalagarh Resort hotel. We will spend afternoon in Heritage Hotel with Lunch and Relax in the Himalayan Foot Hills. After relaxing in Nalagarh Resort and Grand Lunch, We finally Proceed to Shimla at a distance of only 95 kms through State Highway No 16, which is approx. Max 1.5 to 2 hours’ drive away. The drive is breathtaking, We follow two options, Either go through the NH 21 through Mandi , Sundernagar to Manali or through State Highway 22 and 305 through Tirthan Valley ( Banjar) to Kullu Manali. Mandi - Sundernagar route is also worth exploring, while Tirthan Valley route is less travelled and passes through some of the spectacular scenes. Well if we go through Mandi Route , We Drive past Beas-Sutlej Link project, Pandoh Dam & Kullu Valley. enroute Visit Main Sqaure of Mandi town, The main square of mandi town is majestic and takes you to another age. Seeing is beleiving. We will drive through the main sqaure and you will have photo shoot opportunity here. Start from Mumbai for your great Himachal tour early Morning, We can book your flight/train tickets from Mumbai to Delhi. Our Holiday Travel Executive will meet you upon arrival at airport/railway station in Chandigarh. We drive to Nalagarh by Private AC Cab. En-route visiting Pinjor Garden near Chandigarh and stop overs at various scenic points for photo shoot depending on time availability and weather conditions. If you are interested to see the Chandigarh Attractions, we can cover the main attractions in 2 hours’ time and proceed. After Pinjor Garden, Proceed to Nalagarh which is approx 40 kms away. Upon arrival at Nalagarh , check in at Heritage Nalagarh Resort Hotel. Rest of the day is at your leisure. Enjoy your stay in the Nalagarh Resort- Maharaja Style..
From Chandigarh, Reach Kalka and Board the Heritage Toy Train to Shimla in Luxury class, A breathtaking Journey through an engineering marvel, a rare feat acheived during British Era. If you had opted for Chandigarh Stay, we can still cover Nalagarh to acclimatize you and give you a taste of Luxurious heritage Stay, We proceed to Nalagarh, A eponymous Historical princely state during the British Raj, it is 45 km from Chandigarh and is a gateway to Himachal Pradesh, we will have Retreat in Luxurious Heritage Nalagarh Resort Fort Resort nestled in the quaint Hills, built in 1421 during the reign of Raja Bikram Chand.at Nalagarh Resort hotel. We will spend afternoon in Heritage Hotel with Lunch and Relax in the Himalayan Foot Hills. After relaxing in Nalagarh Resort and Grand Lunch, We Proceed to Shimla at a distance of only 95 kms through State Highway No 16, which is approx. Max 1.5 to 2 hours’ drive from Nalagarh. Reach Shimla by Evening. Check into the select Shimla hotel & Evening at your leisure. Visit Mall Road in the evening after your dinner & also Ridge to enjoy the Shimla's view & crowd. Today has been a very busy Day, hence a good night sleep is recommended. In the Afternoon, Visit Scandal Point & Shimla Church. Night Stay at hotel in Shimla. After breakfast at hotel, depart for Manali. We have two options, Either go through the NH 21 through Mandi , Sundernagar to Manali or through State Highway 22 and 305 through Tirthan Valley ( Banjar) to Kullu Manali. The choice is yours, Mandi - Sundernagar route is also worth exploring, while Tirthan Valley route is less travelled and passes through some of the spectacular scenes. Well if we go through Mandi Route , We Drive past Beas-Sutlej Link project, Pandoh Dam & Kullu Valley. It is said that Mandi nahin dekha to kuch nahin dekha, Enroute to Manali from Shimla, we will show you glipses of Mandi town. Situated on the banks of River Beas, Home to IIT and busy, bustling age old bazaar, Gompas, A city built on the designs of vastu Shastra, with the air or spirituality, Home to numerous temples, ancient bridge over Beas, Mandi is truly a place to visit. Visit Main Sqaure of Mandi town, The main square of mandi town is majestic and takes you to another age. Seeing is beleiving. We will drive through the main sqaure and you will have photo shoot opportunity here. Next move to see the famous 12th centuary famous Bhootnath temple and have Darshan of famous Shivalinga. Next Attraction enroute is famous Rewalsar Lake, Located at 25kms from Mandi at height of 1360 meters. It is surrounded by lush, vardent scenary and famous gurudwara as well as Monastery. There are also 3 hindu temples. If you wish, we can also take you to the Prashar Lake, which is located at 2730 meters ( Visit to Parashar lake may require night stay in Mandi town, if we get late). The Prashar lake is rated as the most beautiful lake of World framed by snowcapped peaks, three tier pagoda temple dedicate to Sage Parashar. The mountains and Himalayan Views from the Prashar Lake are incredible. We will ensure that enough stops we make at picturesque Points to click cameras & take memoirs..
Reach Manali late in the evening & Check in to your hotel in Manali on arrival. After breakfast at hotel, proceed for a half day sightseeing tour. Visit Vashishtha Kund, Hidimba Temple, Manu Mandir and Gayatri Mandir. Rest of the day is at leisure for independent activities. Stay overnight at the hotel in Manali. Early morning wake up at 1:30 AM and we proceed at sharp 2:30 AM for the Rohtang Pass Trip, take a half day excursion to Rohtang Snow Point. (closed on Tuesday).On return, take a half day excursion to Solang Valley. You can opt for adventure sports like Para Gliding, Zorbing, Skiing (subject to snow) on direct payment basis. Rohtang pass is 51 Kms | 2hrs one way. It is not accessible for almost eight months in a year as it is covered by snow. We generally visit the snow point on Rohtang Road subject to weather conditions. Solang Valley: All the adventure sports at Solang Valley are on direct payment basis & subject to weather conditions. *Both the Rohtang Pass & Solang Valley is to be covered on the very same day. After breakfast, transfer to Delhi/Chandigarh airport to board your flight to Mumbai or Train Station to board your train to Mumbai. For those who want to go from Chandigarh and have an evening flight/train, take a tour of Rock Garden & Sukhna Lake (Entry tickets and Boat ride charges to be paid directly) before drop to airport/station. Manali Shimla Tour package from Mumbai is Holiday Travel's Most Famous and successful package with more than 75000 Satisfied Customers and Still Growing. We have managed to keep this tour pricing cheapest in the whole industry even by including Private Luxury Taxi at your disposal through-out Journey and select 4 star hotels with Best Breakfast & Dinner Menu including site seeing to Snow point, Rohtang pass in Manali + full site seeing in Shimla + Bonus Site Seeing enroute Shimla to Manali. Shimla got its name from a Hindu Goddess ‘Shyamala Devi’ who is an another incarnation of Goddess Durga. Kufri is a great place to unwind-with panoramic views of the Himalayas, adventure sports, steep hikes. 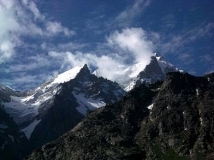 Manali is a popular hill station located in the Indian state of Himachal Pradesh. Manali is situated at an altitude of more than 2000 m from where the eyes fall on the views of forests, orchards, river, mountains ranges and more, for nothing but sheer visual delight. Manali is one of the best honeymoon destinations of India. Manali is located at northern end of Kullu valley. With the help of Lord Ganesha Rishi Ved Vyas wrote the epic Mahabharata at the source of the Beas. This river Beas orgininates from Manali. Make a Delicious and happy tour with family, Holidaytravel.co stands to make your holiday trip with great and memorable tours. HolidayTravel.co is the most reliable family Tour Planner for Himachal Pradesh, Uttrakhand & North India. We are located in Himachal Pradesh, Delhi and are the best and safest family tour services provider in Himachal. Our Soul aim is to showcase beautiful Himachal and Magnificent Shimla Manali, Dalhousie - The Switzerland of India & Dharamshala - the Tibetan Capital in Exile. 5. Find yourself in cool compartments of Himalayan queen toy train ride from Kalka to Shimla, forget crowded Mumbai Locals. 6. From Bollywood & Tollywood to Kingdom of Himlayas.. When you travel or book a tour with Holidaytravel.co, just feel extra confortable and safe with us, we offer best family safe travel packages who travel with kids or elders, also we hire very disciplined drivers and staff to make your journey memorable and safe. So just book a tour with Holiday travel and enjoy our safe trips in India.